1903 Noguchi met Yeats in London in January. 1903-4 Yeats's American lecture tour. 1904 Noguchi's "Eibungaku no shin choryuu" [A New Current in English Literature], in Eibun Shinshi (The Student) is the first extended discussion of Yeats's work in Japanese. 1907 Mr. Yeats and the No introduced Yeats to the Noh drama, which subsequently became an important influence. 1907 Noguchi's "Yeats and the Irish Revival" in the Japan Times comments on the significance of the Irish revival. 1911 Noguchi's essay "A Japanese Note on Yeats" (1911, also included in Through the Torii, 1914). 1914 Noguchi's meets Yeats and Ezra Pound in London, as described in "W.B. Yeats," T.P. 's Weekly (Jan. 1915) and "A Japanese Poet on W. B. Yeats," Bookman (N.Y.) (June 1916). 1917 Noguchi discusses Yeats's 1916 No play, At the Hawk's Well in an essay, "Yeats and the Noh Play of Japan," Japan Times, 2 Dec. 1917. 1920 Yeats cancels his plan to take a position as lecturer at Keio and Tokyo universities. 1920 Noguchi dedicates Japanese Hokkus to Yeats. 1921 Yeats, in his one surviving letter to Noguchi, expresses thanks for a copy of Hiroshige and regrets not coming to Japan. 1935 Yeats uses Noguchi's translation of Kobayashi Issa's haiku in "Hobby" as the basis for his poem "Imitated from the Japanese." see W. B. Yeats, Imitated from the Japanese (David Ewick's page). Shotaro Oshima, W.B. Yeats and Japan (Tokyo: Hokuseido Press, 1965). Edward Marx, "Yone Noguchi in W.B. Yeats's Japan," Yeats Annual 17 (2007). 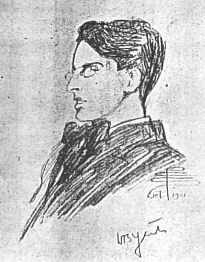 Sketch of Yeats by Pamela Colman Smith from Noguchi's Eibei no Jusannen (Thirteen years in England and America, 1905).